Get information about your business out into the public today with our eye catching and sophisticated magazine stand. Our nylon brochure stands are perfect for anyone who needs a lightweight and portable literature stand. They are ideal for many different magazines, brochures, or any other information you wish to distribute or display. The magazine stand can be used as a portable display and is also ideal for a more permanent magazine holder in many locations, such as trade shows, events, and retail stores. 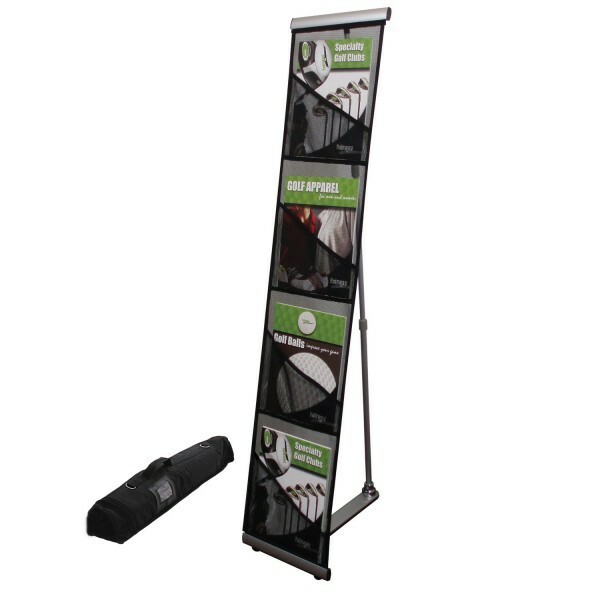 Our nylon brochure stand is made of black mesh and has 4 pockets. With a weight of only 3 pounds, this magazine stand, otherwise known as a literature stand, is perfect for transporting. With an easy "roll up" system, taking this magazine stand apart is a cinch! Included is a nylon carrying bag that carries the entire magazine stand for great portability. 8 pocket stand also available.